JERUSALEM — Vice President Joe Biden yesterday assured Israelis that the United States is determined to prevent Iran from acquiring a nuclear weapon and urged Arab states, equally worried about Tehran’s nuclear program, to take steps toward peace with Israel. Biden drew a link between the effort to thwart Iran’s nuclear ambitions and that of trying to push forward peace negotiations between Israel and the Palestinians. “They are connected indirectly, but there is a relationship,’’ Biden said in a speech at Tel Aviv University. Beyond reaffirming US support for Israel’s security, Biden told Israelis that “the status quo is not sustainable’’ in terms of the conflict with the Palestinians and pressed Israel to make a peace deal with President Mahmoud Abbas and Prime Minister Salam Fayyad of the Palestinian Authority. Biden said Israel should act while it still has partners who share the goal of a two-state solution. Biden welcomed a statement released by the office of the Israeli prime minister, Benjamin Netanyahu, shortly before he took to the podium in which he emphasized that the construction of 1,600 homes in a disputed area of Jerusalem would not begin for at least a year. 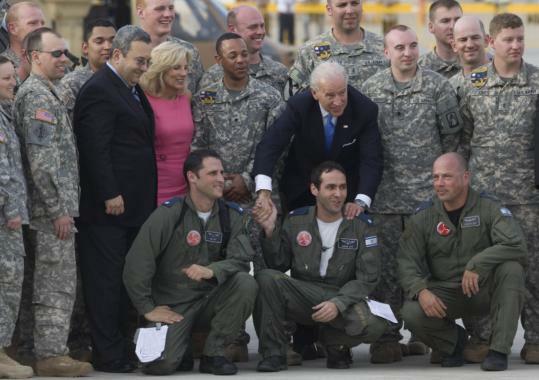 The announcement of construction in Ramat Shlomo overshadowed Biden’s trip, meant originally as a celebration of the US-Israel alliance. It caused the Palestinians to balk at returning to US-mediated negotiations on a final peace deal. The approval of new housing forced Biden to condemn Israel’s actions. Netanyahu took pains to mend fences, saying he regretted the timing of the announcement, though not the actual building itself. Netanyahu summoned Interior Minister Eli Yishai on Wednesday “and expressed his displeasure at the timing of the announcement of another stage in the planning process of a Jerusalem building project,’’ the statement said. “In light of the ongoing disagreement between Israel and the US on building in Jerusalem, Prime Minister Netanyahu said there was no need to advance the planning process this week and instructed Interior Minister Yishai to adopt procedures to prevent such an incident from recurring,’’ the statement, released by Netanyahu’s media adviser, added. Netanyahu said that final approval for the construction project would not be given for a year but that it would not be canceled. Biden hoped that would be enough to salvage indirect negotiations on the future of Jerusalem. But the Palestinians said yesterday that they want the project revoked before talks begin. “What is required is that when [US envoy George] Mitchell comes back is that he is supposed to succeed in revoking the Israeli settlement decisions in East Jerusalem in order to give an opportunity to launch the indirect talks,’’ Reuters quoted an Abbas’s aide, Nabil Abu Rdainah, as saying. Abbas told Amr Moussa, Arab League secretary general, on Wednesday that he had decided not to enter the talks for now. The Arab League had endorsed a four-month framework for the US-mediated negotiations. “The Palestinian side is not ready to negotiate under the present circumstances,’’ Moussa said in Cairo.